Republic TV has yesterday released the projected numbers from their C-voter survey for seven remaining states. Last week they had released opinion poll projections for 256 of the total 543 seats. 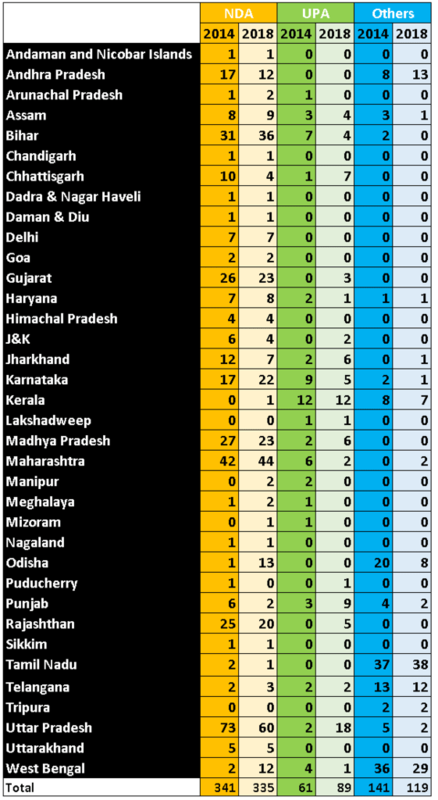 Opindia.com had published the tally of seats C Voter had predicted. Yesterday the projected numbers for the remaining 287 seats poured in and though the NDA is projected to retain a majority in the Lok Sabha, they may lose several of their current seats in Uttar Pradesh and still fail to emerge as a strong power in Tamil Nadu. West Bengal, however, is expected to see a saffron surge. In West Bengal the BJP is set to gain, jumping to 12 seats from the 2 in 2014 while the UPA will sink further to a mere single seat from their 2014 number of 4 seats. The TMC is losing several seats too, as predicted by the C-voter survey. In Sikkim, though the NDA is set to retain their seat, they are set to lose vote share. The vote share of UPA is predicted to rise. In Telangana, The NDA is set to win 3 seats as compared to 2 in 2014 although it may see a 5.7% surge in vote share. The UPA vote share will see a very slight dip as they retain the 2 seat tally. In Tamil Nadu, the NDA is losing a seat to reduce to 1 from 2 in 2014. The UPA as before will fail to win a seat while others (DMK chiefly) will be the majority force. The NDA is looking at a 7.8% dip in vote share while the UPA is looking at a 3.1% increase, as reported by the survey. In Tripura the BJP is not expected to win a seat, however, they are looking at a significant 25.4% increase in the vote share as compared to a dip of 3.2% for UPA. In Uttarakhand, the NDA is set to retain all 5 of its current seats while expecting a slight 4.1% dip in vote share. In Uttar Pradesh, the BJP is expected to lose several of its current seats. The BJP which won 73 of the 80 seats in UP in 2014 is expected to come down to 60, though the overall dip in vote share is not very significant. The UPA is set to win big, upping its tally to 18 seats from the current 2 (Rae Bareilly and Amethi for Sonia& Rahul Gandhi ). The UPA is looking at a massive surge of 22% in its vote share.